With the 2019 Annual Meeting of the American Meteorological Society approaching, it makes sense to highlight the host city, Phoenix, Arizona. The state capital of Arizona has the 5th highest population in the United States, and is just a few hours away from the fabulous Grand Canyon. Phoenix is in a hot, desert climate. As a result, they experience extremely warm summers, and mild winters. The official weather station is east of the city, and has been in existence since 1933. The average annual temperature is 75 degrees Fahrenheit, which is one of the highest in the nation. As expected, the highest temperatures occur in the Summertime (June, July, August) with average daily max temperatures above 100 degrees (103.9, 106.1, 104.4, respectively). Temperatures peak typically in late June and early July, then slowly dip down until September, when a much noticeable drop occurs. Wintertime temperatures are frigid, but above the freezing mark. December, January, and February minimum averages are 44.8, 45.6, and 48.7, respectively. The figure below depicts current temperatures for the 2018 year. Daily maximum (red) and minimum (blue) temperatures are compared against a 30 year climatology (smoothed dark bars) and its extreme (jagged light bars) values. Record breakers are also indicated by dots. In 2018 the overall temperature was 1.8 degrees above normal. There were also more overnight warm records (15) than daytime (9). This indicates overnight temperatures are perhaps warming faster than daytime temperatures. Because Phoenix is in a desert climate, it doesn’t typically see a lot of rainfall. This can be seen in the accumulation chart below. The wettest year ever recorded occurred in 1941, when only 15.37” of rain fell the entire year. In fact, it typically sees about half of that on average (8.03”, according to a 1981-2010 climatology). That being said, Phoenix is in the area prone to the North American Monsoon, which occurs between June 15th and September 30th. During this time, an influx of moisture surges from the south, and can create enough precipitation to cause flooding problems in the area. While these numbers do not appear high, they certainly are in a desert climate. In fact, the amount of rainfall that fell in 2018 (9.16”) is considered 15.8% above normal. Phoenix isn’t immune to snowfall either, although it is very rare. The highest snowfall ever recorded was in February 2nd, 1939, when a whopping 0.4” fell on the area. 2018 was an interesting year for Phoenix and its surrounding area. During the official monsoon season, only a few inches of rain fell. The city was on pace to be one of the driest years on record. However, October surprised the area with 5.35 inches of rainfall, making it the wettest October on record (and second wettest month ever, only behind 5.56” in August 1951). What caused all this precipitation? It was in fact the remnants of two tropical systems in the Pacific Ocean. The first was Hurricane Rosa, which dumped 0.32” and 2.36” of rain in Phoenix on the 1st and 2nd of October (respectively). A two day animation of rainfall can be seen above. On the 13th, remnants of Hurricane Sergio came into the area and provided another 2.19”. The 2.36” on the 2nd and 2.19” on the 13th currently stand as the 5th and 7th wettest days on record. 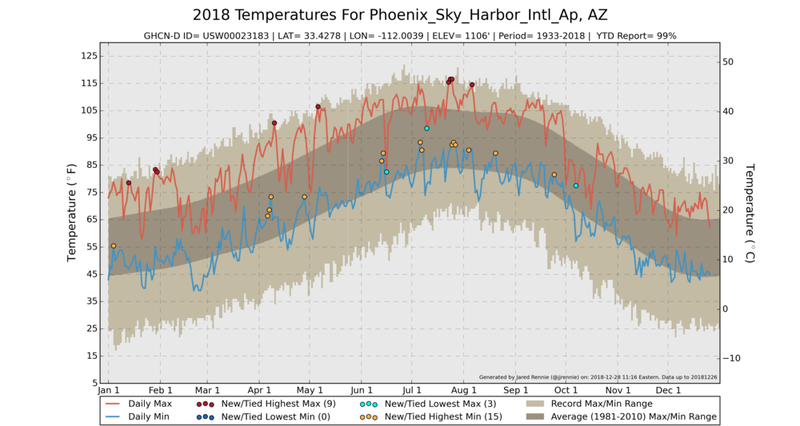 This certainly helped to turn Phoenix from a below normal season to above normal.